Many will take this as a SAD news and many will take this happily. Yes, the countdown for all the JIO Free Offers has started, nobody will be able to use JIO services for FREE after March 31, 2017. Today, there was an official announcement by Mukesh Ambani, about the HOAX that JIO Happy New Year Offer will remain free till March 31, 2018 and the Release of JIO Prime Offer. JIO Happy New Year Offer Rechristened as JIO Prime Offer after 31 March, 2017. Within 170 days of its launch, the JIO community has crossed the 100 million mark, which actually was the first goal of JIO’s administration. Till date, 100 crore GB data has been transmitted or consumed, between or by the JIO users. Don’t you think 3.3 Crore GB data consumption daily is an impressive figure. JIO Plans will always and always remain flexible, so that the users will always get full value for their money. JIO team will regularly monitor the offerings from the other operators and refurbished the plans accordingly with 20% more benefits. No more roaming or voice / video call charges, forget about the blackout days on the JIO network. In term of mobile data usage by any country, India is at TOP position after the JIO launch in September 2016. The main attraction of the JIO supremo speech was the introduction of JIO Prime Offer. 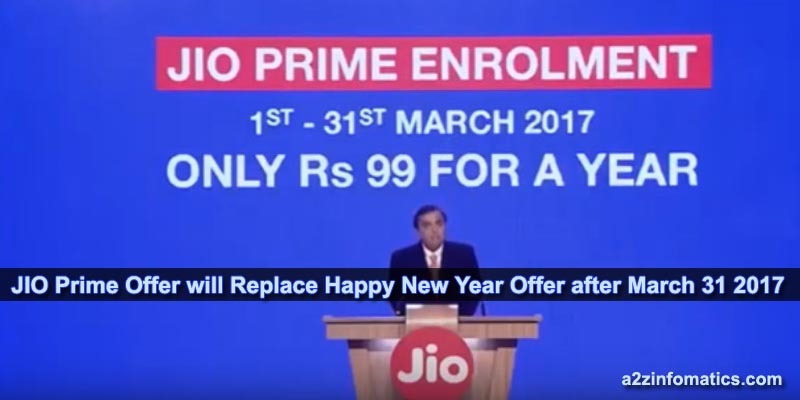 From 1st April 2017, the existing JIO user enrolled in the JIO Prime offer will enjoy the same unlimited benefits as of JIO Happy New Year Offer for complete 12 months (till 31 March, 2018), at down to earth charges. He repeated, the voice / video calls will always remain free with no roaming charges on the home network. Below is the detailed information about JIO Prime offer. What is JIO Prime Offer ? In simple words, JIO Prime Offer is a one time subscription of INR 99 by the existing JIO users. The subscription / enrolment service will starts from 1st March 2017 and will remain open till 31st March 2017. Benefits of the JIO Prime Offer. After subscribing to the JIO Prime Offer, the users can enjoy the same unlimited benefits as of the JIO Happy New Year Offer by paying INR 303 per month. As per the current announcements, JIO Prime Offer will be valid till 31 March, 2018. In simple words, JIO Happy New Year Offer is available for 12 more months @ INR 3636 under the tag “JIO Prime Offer”. Below are the detailed benefits of JIO Prime Offer @ INR 303 per month. Unlimited Free Voice / Video Calls. Unlimited Free Internet Data (with Fair usage policy of 1GB per day, after 1GB consumption the speed will reduce to 128 kbps. Complimentary Free access to the JIO’s media services, for complete 12 months till 31 March 2018. No Roaming at home network. Amazing Offers all the time, giving full value to the JIO community. How to Enrol for JIO Prime ? Using MyJio mobile app, subscription option will be available from 1st March 2017 till 31st March 2017. Existing users can avail JIO Prime Offer by visiting JIO’s official website, JIO.com. The enrolment starting and the ending time will remain same for all the registration versions. The easiest way to enrol for JIO Prime Offer is to visit any JIO Retail store. At present, there are 10 Lac JIO retail partners all around the country. You may like: How to BUY Reliance Jio Rs 1000 4G Mobile / Smartphone with VoLTE Support. Unlimited Maza… Continue Hoynga!, JIO Prime Members can get all the JIO Happy New Year Offer benefits for the down to earth introductory price of only INR 303 per month (Rs 10 a days) for complete 12 months, till 31st March, 2018.